After becoming members of the PDC and attending regular PDC conferences, Lacie Marshall, Katherine Beach and Rebecca Lyon observed that there was a growing contingent of Los Angeles-based PD professionals. 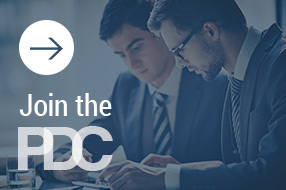 Recognizing the value of being involved with the PDC and having access to the incredible resources membership offers, they decided to contact the PDC to discuss the possibility of establishing a local group. What started as about 12 members has grown in the last two years to 30 plus members strong. We meet about once per quarter. We are in the process of identifying a location and date for our next meeting. If any of our members would like to volunteer their office, please don’t hesitate to contact Hannah Fabrikant (hfabrikant@mwe.com) or Lacie Marshall (lmarshall@loeb.com). Join the Los Angels Local Group Online!